I finally signed up for a 6-week photography class (yay!) with a local professional photographer. So once a week I spend 2.5 hours of kid-free time (double yay!) learning about my camera and photography in general. The class has been extremely helpful! I’m already feeling more comfortable with my camera, but definitely looking forward to learning more in the remaining 4 weeks. 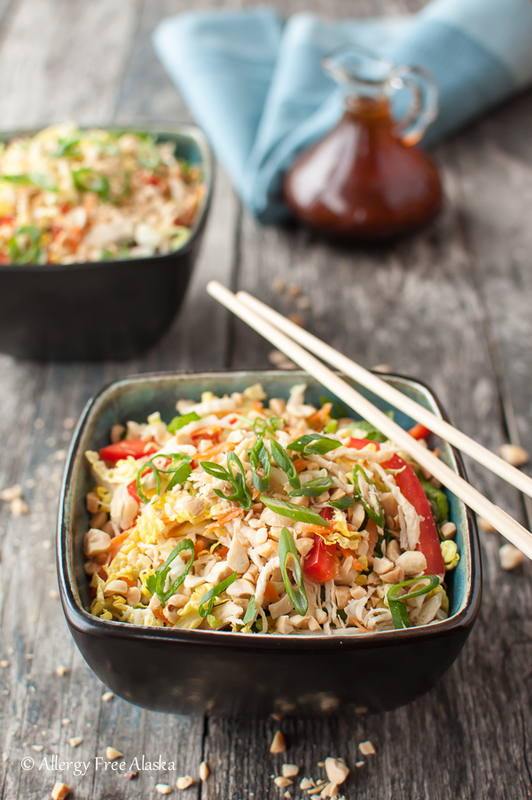 This Asian Chicken Salad with Spicy Sriracha Dressing is a family favorite. We devour it completely in almost one sitting. I don’t make it very spicy when I make it for the four of us (my youngest can’t take a lot of heat), but you can adjust the heat to your preference. Feel free to either leave the Sriracha out altogether, or to double the amount I call for in the recipe. It’s totally up to you! 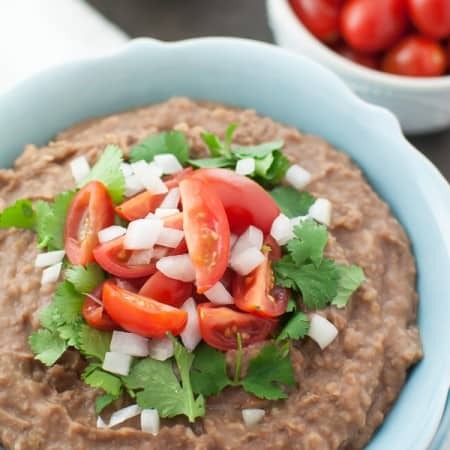 This is one healthy meal you can feel absolutely great about feeding your family. Sweet, crunchy, and flavorful Napa cabbage is packed with vitamins and fiber, while being very low in calories. It is high in folates, and is packed with antioxidants. Combine that with a plethora of other fresh vegetables, tender chicken, and a sweet and spicy dressing… it’s absolutely addicting! 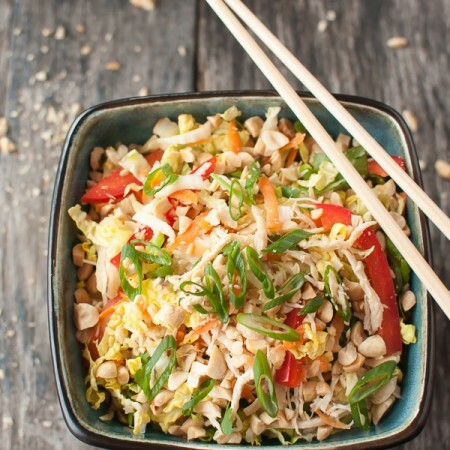 We enjoy topping this salad with dry roasted peanuts, but if you’re allergic, or don’t have them available, toasted sesame seeds or almonds would also be wonderful. Replace the lite rice vinegar with white wine vinegar. Also replace the gluten-free soy sauce with coconut aminos; you just might need to add sea salt to the dressing to compensate, because coconut aminos aren’t as salty as soy sauce. 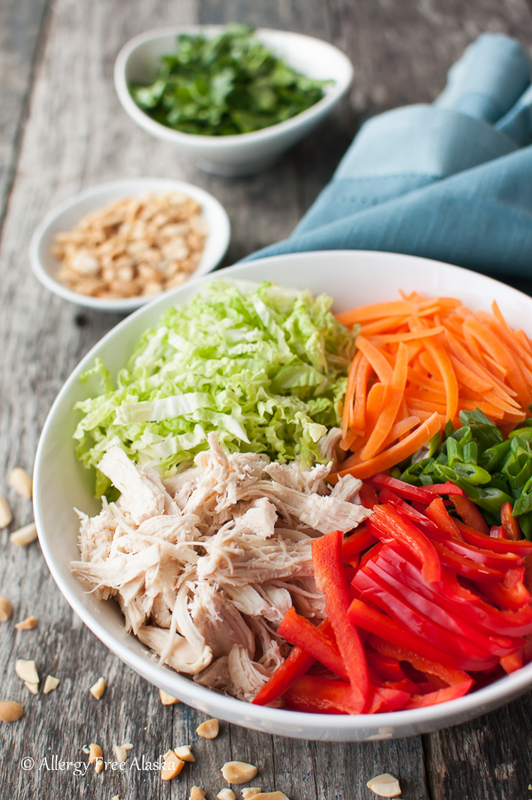 You might also like this Easy Healthy Taco Salad from Wholesome Yum. This is one healthy meal you can feel absolutely great about feeding your family. 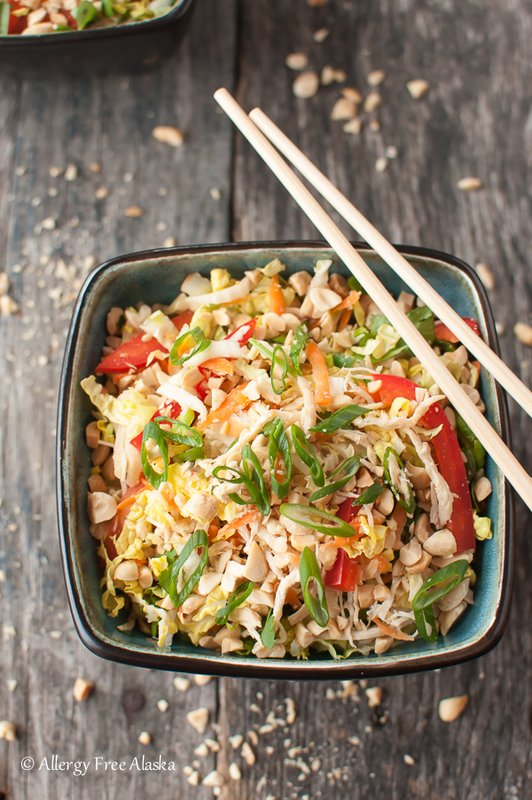 Crunchy Napa cabbage is combined with other veggies, tender chicken and topped with a sweet and spicy Sriracha dressing. 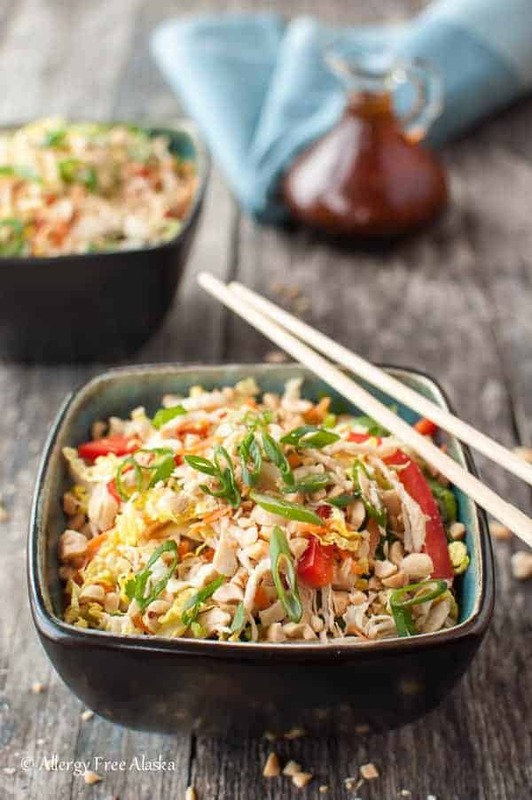 In a large mixing bowl, combine the leftover shredded or cubed chicken, Napa cabbage, red bell pepper, carrots, scallions and cilantro. In a small mixing bowl, whisk together the gluten-free soy sauce, lite rice wine vinegar, garlic, ginger and coconut sugar. Add the sesame oil and olive oil, and whisk until blended. Season with Sriracha to taste. Dress the salad when ready to serve. I panic if I don't have enough dressing to please everyone when I'm making a large salad, so dress the salad to taste. You may decide not to use all of it. Replace the lite rice vinegar with white wine vinegar. Also replace the gluten-free soy sauce with coconut aminos; you just might need to add sea salt to the dressing to compensate, because coconut aminos aren't as salty as soy sauce. This recipe is linked to Savoring Saturdays. This salad looks so great, Megan! I can’t wait to give it a try! 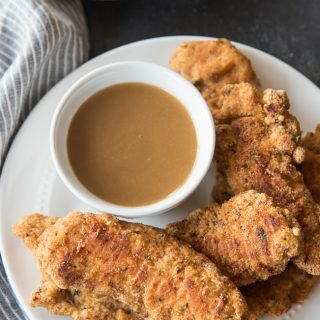 This recipe including the dressing is almost identical to a recipe my 21 year old son and I served for a fundraiser for Big Brothers, Big Sisters this past summer. Part of the criteria is the food had to be grilled, so we tea smoked, grilled the chicken and shredded it. Instead of the green onions, we used the dressing to pickle finely shredded mild red onions, then used the pickling liquid to dress the salad. It was a big hit. I hadn’t thought to try the recipe with leftover roasted chicken, and I almost always have that on hand, and I almost always have green onions on hand. This recipe we could have much more often since I’m not a die hard grilling person when the weather is bad. This I have to try. I love Asian salads. The purpose for the napa cabbage in my fridge is now clear. I want to put this dressing on everything! Love that you used coconut sugar. So good! Hi, Megan! This salad looks delicious! The chili sauce, however has corn ingredients (the vinegar & xanthan gum). Any ideas on substituting the chili sauce so my husband can eat it too? This looks so good!!! My family would love this. Thanks so much for sharing with us at Savoring Saturdays gluten free linky party. Hope you’ll join us again this week.